Everyone says you have to go to Plucky's Shindig with a firm shopping list. You need to know what patterns you're buying for and have some ideas of the colors you want. So I did just that. I spent days working my list so I had just the right mix of sweaters and accessories to get me through the next six months of knitting. I was committed. Then I saw the Shindig Marketplace in person. And all of my plans flew completely out of my mind. I thought I would share a couple of my favorite purchases with you. I'm too embarrassed to confess to all of it. Definitely overshopped, and really happy with every last skein that came home with me! Truth or Dare on Primo Aran was the first yarn that caught my eye when I wandered into the Marketplace and I was unable to leave without it. The Olivia Shawl was my gateway drug for knitting with Plucky, and I'm contemplating another in this extraordinary colorway, but keeping my eyes open for other possibilities. This color is called Bedrock and I have no idea where it has been all my life. It's a dusky shapeshifter with grays and greens and browns and it's perfect. At the end of the day it reads as a gray. Why yes, that's Cashmere Aran. I didn't see Bedrock on any other base and I was unable to resist. A hat? Stripes in a sweater or shawl? No clue. I'll be happy to keep this one out and pet it several times a day for the next few weeks. The Village on cashmere sport was another colorway so irresistible I couldn't put it down once I saw it. Again, I have no plans. But I consider myself lucky because this was a singleton skein. I'm afraid that if there had been more, I would have shamelessly bought them all. Maybe some fingerless mitts for me. This color is one I'm going to want to keep close. 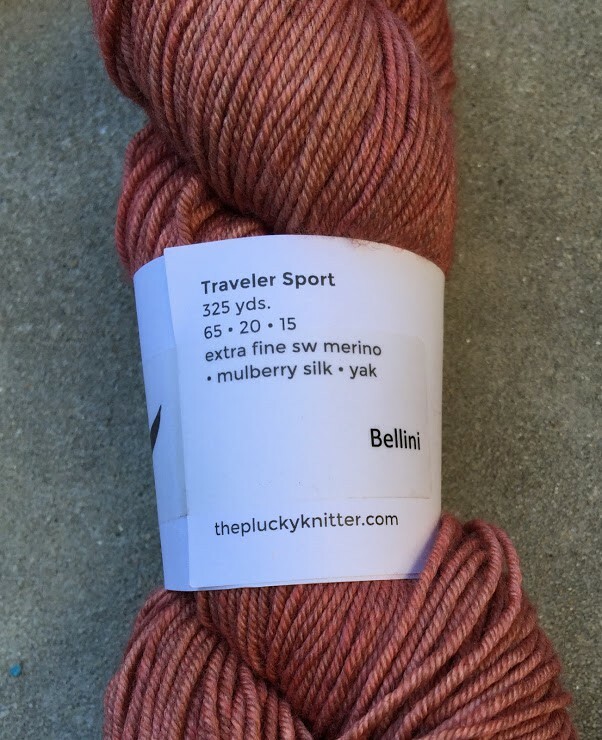 Last but not least, this charming skein of Bellini on Traveler Sport. This may become the accent color in my Hexed shawl. But it would also be great for the Norie hat that has been on my queue for a long time. It's such a sweet color and it begged to come live with me. I was unable to tell it no. Shopping at Shindig was a lot of fun. I think I'm done for a while, but half the fun of the whole gig was seeing what people picked out and finding out how they planned to use it. I'm hoping a lot of other people will share their new stash ups — if they do, I'll share some links at the bottom of this post (or feel free to add your own links in the comments below). That’s pretty much how my Stitches West marketplace experiences have gone, haha. And then a few days later the yarn fumes clear and you kind of wonder what happened. 🙂 I got a skein of Bellini Single in a tasting menu and while I wasn’t in love with it on first sight, it looked so delicate and pretty when held up in the mirror.